Stuck in a lunch rut? Forgo that boring old turkey sandwich and liven up your workday with something new and exciting. From quinoa salads to wraps to panzanella, these 11 filling lunches break traditional brown bag rules with unexpected food pairings, bold, fresh flavors and lively ingredients. This light but filling Strawberry Quinoa Caprese Salad with Spicy Balsamic Vinaigrette from Sweet Peas & Saffron is mixed with a touch of cayenne pepper for a slight kick. With such a unique mix of flavors, this salad is far from boring, and quinoa is packed with protein to keep you full through the five o’clock hour. The Black Bean and Corn Salad from Bowl of Delicious only takes ten minutes to prepare. While this salad is filled with nutritious and fresh ingredients, it will definitely satisfy those unhealthy Mexican food cravings with the blend of lime, peppers and cilantro. Just because it’s lunchtime does not mean you can only eat a salad or sandwich. Smoothie bowls are an easy way to fill up on all kinds of beneficial vitamins. Honey & Velvet’s Superfood Acai Bowl is simply made in a blender like a smoothie, but topped with energizing and filling ingredients like hemp, Chia and flax seeds. The Kitchen Alchemist’s Courgette Noodle Salad is a zucchini pasta salad that tastes even more flavorful when chilled. Lemon juice, feta, basil and sun-dried tomatoes spruce up this pasta salad into a gourmet dish you can look forward to. If you have some leftover quinoa from a previous work lunch, combine the quinoa with some other kitchen staples for these easy Quinoa Fritters from Becomingness. Heat them up at work and dip in a cool garlic aioli for comfort food that you won’t regret. A light salad sounds like a great idea the day before work, but an hour before lunch you are probably wishing you had made something a little more, well, substantial. Black beans and strawberries may seem like an odd combination, but An Edible Mosaic’s Strawberry Black Bean Salad just proved the combo is as perfect as PB&J. Make this Sweet Potato and Chickpea Salad from Avocado Pesto ahead of time and you’ll end up with three pre-made lunches for the week. Sweet potatoes are full of vitamin A and chickpeas provide a high level of iron and fiber. Cumin, coriander and garlic are just a few of the flavors that make this salad full-bodied. The Caprese Chicken Panzanella Salad from Peanut Butter & Peppers is assembled with fresh mozzarella and juicy tomatoes. This textured salad is more filling with the baguette and chicken mixed in. Carrot or Cake’s Farro and Celery Salad with Ricotta Salata, Walnuts, and Dried Sour Cherries will give you a full week of work lunches. You won’t mind enjoying this salad every day with the bold flavors of dried cherries and Dijon mustard. The creamy texture makes this salad much more satisfying than brittle lettuce. 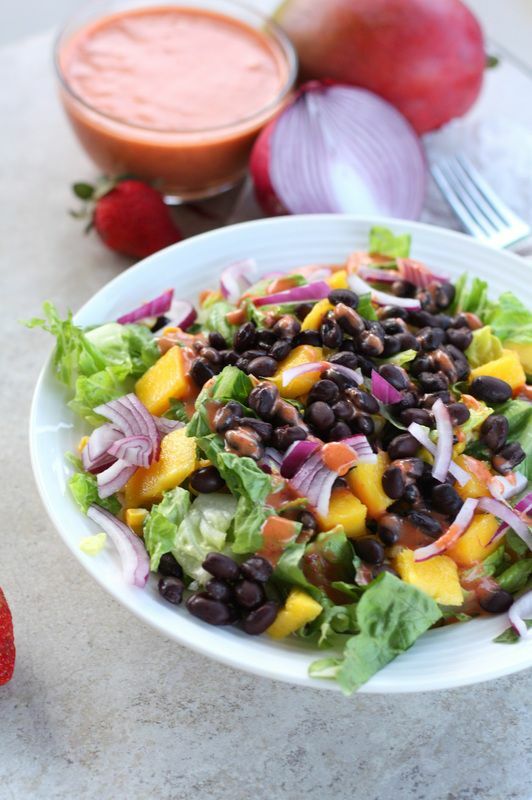 The Mexi Mango Salad with Strawberry Chipotle Dressing from Droolworthy is a lighter, more tropical version of the universally loved taco salad. The dressing is easy to prepare and is made with a rare blend of strawberries, cumin, balsamic and lime. Chicken and quinoa make The Kitchen Prep’s Honey-Dijon Chicken Quinoa Wraps very filling. The honey-Dijon adds a tangy, creamy texture, while the apple slaw adds some crunch and sweetness. This wrap is more like one you would order from a restaurant and far from those flat and soggy wraps we have all once made.